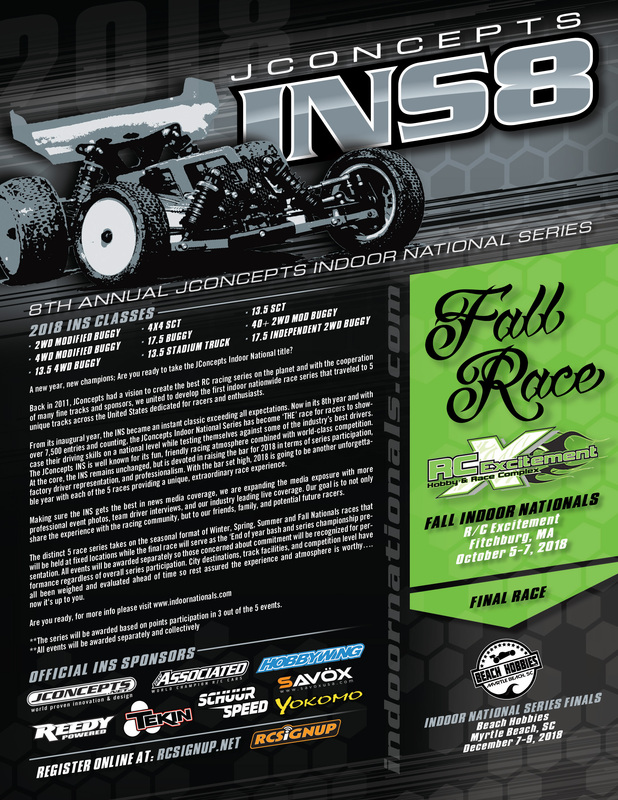 The JConcepts Fall Indoor Nationals are back at RCE. This is our 9th year holding this Event. This is definitely a race you do not want to miss. With top drivers from all over the country coming in to race the best drivers in New England. We have seen everything from epic upsets to photo finishes. You just never know what is going to happen, but it is always exciting. We have some new classes being run this year as well, 13.5 Short Course, 13.5 Stadium Truck and 17.5 Independent 2wd Buggy (no sponsorships allowed). Then there is the fan favorite 40+ 2wd Mod Buggy. All this adds up to a weekend you will never forget. Track Name R/C Excitement, Inc.
3 qualifiers - 5 minutes each. 9 car mains + 1 Bumps. 3 qualifiers - 7 minutes each. 9 car mains + 1 Bumps.